Wings, beer, and sports: it seems you won’t find one without the other two in American restaurants and pubs. Business owners unanimously take advantage of the intrinsic connection between watching a sports game, drinking a cold pint, and eating a plate of chicken wings. How did this combination become so irresistible to sports fans? 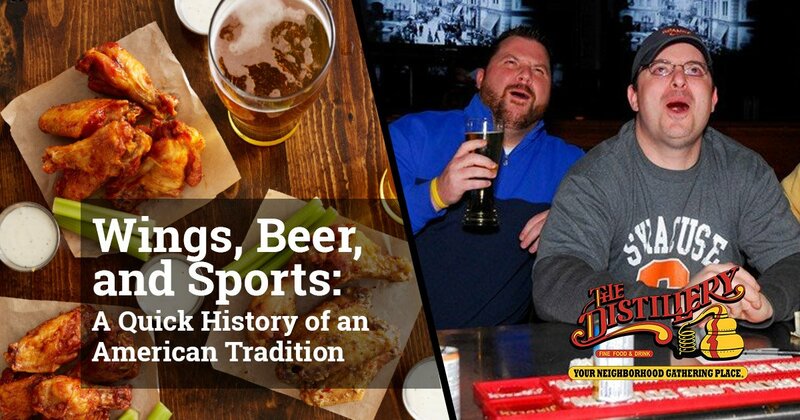 Here’s a brief history of this trifecta, brought to you by the wings, beer, and sports enthusiasts at The Distillery. 1939: First Televised Sporting Event in the U.S.
Americans love for watching sports on television traces back to the very first televised sporting event in the country: a baseball game between the Columbia Lions and Princeton Tigers in 1939. Later that year, the first American football game hit the small screen. Sports fans gathered together to watch big games not long after televised sports hit the air. Watching sports on television quickly grew in popularity, leading to it becoming a group activity. According to an ESPN Sports poll, over 70% of fans say they plan to watch sports with others. This soon led to gatherings at local bars and restaurants, where people could not only mingle with fellow fanatics, but enjoy delicious food and beverages while they watch. Beer and sports have gone together since bars began broadcasting sporting events and serving alcohol to patrons. It wasn’t until after 1964, however, that the third factor came into existence. In 1964, Teressa Bellissimo, owner of the Anchor Bar, invented the Buffalo wing. When these hot and spicy wings took off around the nation, the nature of watching sports game changed forever. Today, watching a game just isn’t the same without a cold beer and a plate of hot wings. If you agree, we have your perfect place right here in New York. Get your fix at The Distillery – your neighborhood gathering place!